You must have had to deal with a faulty computer at some time or the other. And you also might know how annoying it is to work on a computer that keeps stalling or getting stuck while you are doing some important task. Your work gets delayed due to this as you have to put up with the slow pace in which your computer in running. But this is just the start of all your troubles, as sooner or later your computer is sure to stop functioning altogether. You might not be able even to able access the important data that you had stored on that computer further delaying your work. This may also result in huge losses to your business because of the downtime. Especially if you own a business, part of your infrastructure may include computers and laptops which certain members of your staff will use on a daily basis. Since these computers are being used for almost the entire day, certain issues are bound to arise after a certain period. These issues may come in the form of hardware problems like monitor distortions, wiring, connectivity issues, and other hardware related malfunctions. In addition to this, some software errors might also arise in cases when certain malware or other online threats manage to sneak into the computer systems of your employees. These will subsequently lead to hard disk crashes and file corruptions. It is, therefore, very important that you assign a separate computer repair service provider to handle such issues. Since the computer system is a very complex piece of equipment, you will require the hardware services of professionals to take care of all the issues that come up from time to time. 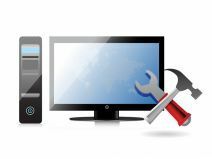 And when you have your own designated computer repairers, you will always be updated on the latest software’s and other computer components which will make your systems function more efficiently once they are installed. What’s more is that they will be available to service your computers as and when you require them, thus reducing the downtime that occurs due to slow systems. Another advantage of having your own computer repair service provider is that you can ensure they make monthly visits to your businesses offices and carry out the maintenance of all the computers in your network. Having a monthly check up will make sure that your computers run properly and reduce the instances of system failures. A specialized computer repair service provider will be able to detect certain errors that may disrupt the normal functioning of your PC’s and deal with the problem before it becomes a serious issue. Installation of the latest firewalls, anti-viruses, anti-spam and other software are some of the other services that they provide, which will keep your computer systems functioning smoothly.